Contemporary debates about parenthood often focus on parenting philosophies: Are kids better off with helicopter parents or a free-range approach? What’s more beneficial in the long run, the high expectations of a tiger mom or the nurturing environment where every child is a winner? Is overscheduling going to damage a child or help the child get into a good college? While these debates may resonate with some parents, they often overlook the more basic, fundamental challenges many parents face – particularly those with lower incomes. A broad, demographically based look at the landscape of American families reveals stark parenting divides linked less to philosophies or values and more to economic circumstances and changing family structure. A new Pew Research Center survey conducted Sept. 15-Oct. 13, 2015, among 1,807 U.S. parents with children younger than 18 finds that for lower-income parents, financial instability can limit their children’s access to a safe environment and to the kinds of enrichment activities that affluent parents may take for granted. 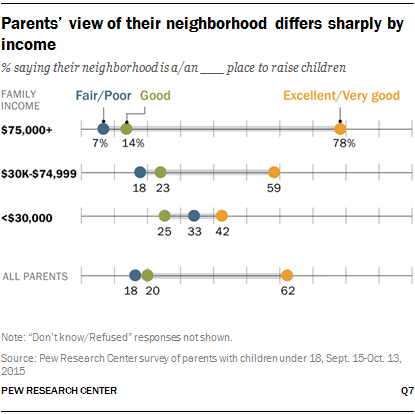 For example, higher-income parents are nearly twice as likely as lower-income parents to rate their neighborhood as an “excellent” or “very good” place to raise kids (78% vs. 42%). On the flip side, a third of parents with annual family incomes less than $30,000 say that their neighborhood is only a “fair” or “poor” place to raise kids; just 7% of parents with incomes in excess of $75,000 give their neighborhood similarly low ratings. Along with more negative ratings of their neighborhoods, lower-income parents are more likely than those with higher incomes to express concerns about their children being victims of violence. At least half of parents with family incomes less than $30,000 say they worry that their child or children might be kidnapped (59%) or get beat up or attacked (55%), shares that are at least 15 percentage points higher than among parents with incomes above $75,000. 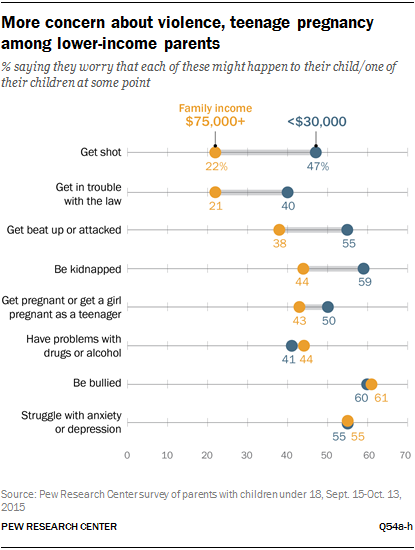 And about half (47%) of these lower-income parents worry that their children might be shot at some point, more than double the share among higher-income parents. There are some worries, though, that are shared across income groups. At least half of all parents, regardless of income, worry that their children might be bullied or struggle with anxiety or depression at some point. For parents with annual family incomes of $75,000 or higher, these concerns trump all others tested in the survey. The survey also finds that lower-income parents with school-age children face more challenges than those with higher incomes when it comes to finding affordable, high-quality after-school activities and programs. About half (52%) of those with annual family incomes less than $30,000 say these programs are hard to find in their community, compared with 29% of those with incomes of $75,000 or higher. And when it comes to the extracurricular activities in which their children participate after school or on weekends, far more higher-income parents than lower-income parents say their children are engaged in sports or organizations such as the scouts or take lessons in music, dance or art. For example, among high-income parents, 84% say their children have participated in sports in the 12 months prior to the survey; this compares with 59% among lower-income parents. These patterns differ sharply across racial and ethnic groups. Large majorities of white (72%) and Asian-American (82%) children are living with two married parents, as are 55% of Hispanic children. By contrast only 31% of black children are living with two married parents, while more than half (54%) are living in a single-parent household. The economic outcomes for these different types of families vary dramatically. In 2014, 31% of children living in single-parent households were living below the poverty line, as were 21% of children living with two cohabiting parents.2 By contrast, only one-in-ten children living with two married parents were in this circumstance. 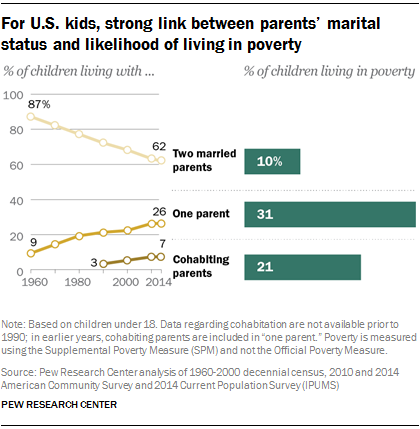 In fact, more than half (57%) of those living with married parents were in households with incomes at least 200% above the poverty line, compared with just 21% of those living in single-parent households. Across income groups, however, parents agree on one thing: They’re doing a fine job raising their children. Nearly identical shares of parents with incomes of $75,000 or higher (46%), $30,000 to $74,999 (44%) and less than $30,000 (46%) say they are doing a very good job as parents, and similar shares say they are doing a good job. Regardless of how they see themselves, parents care a lot about how others perceive their parenting skills. For married or cohabiting parents, the opinion of their spouse or partner matters the most: 93% of these parents say it matters a lot to them that their spouse or partner sees them as a good parent. But most single parents (56%) also say they care a lot that their child’s other parent sees them as a good parent. 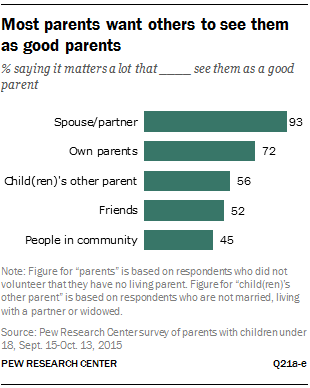 About seven-in-ten (72%) parents want their own parents to think they are doing a good job raising their children, and smaller but substantive shares care a lot that their friends (52%) and people in their community (45%) see them as good parents. Parents are nearly evenly divided about whether their children’s successes and failures are more a reflection of how they are doing as parents (46%) or of their children’s own strengths and weaknesses (42%). Parents of younger children feel more personally responsible for their children’s achievements or lack thereof, while parents of teenagers are much more likely to say that it’s their children who are mainly responsible for their own successes and failures. There are significant differences along racial lines as well, with black and Hispanic parents much more likely than whites to say their children’s successes and failures are mainly a reflection of the job they are doing as parents. About six-in-ten parents (62%) say they can sometimes be overprotective, while just a quarter say they tend to give their children too much freedom. More also say they criticize their kids too much than say they offer too much praise (44% vs. 33%). 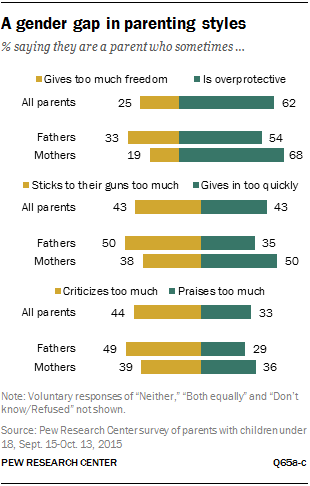 American parents are more divided on whether they sometimes “stick to their guns” too much or give in too quickly (43% each). In several key ways, mothers and fathers approach parenting differently. Mothers are more likely than fathers to say that they sometimes are overprotective of their children, give in too quickly and praise their children too much. Mothers also have more extensive support networks that they rely on for advice about parenting. They’re much more likely than fathers to turn to family members and friends and to take advantage of parenting resources such as books, magazines and online sources. For example, while 43% of moms say they turn to parenting websites, books or magazines at least sometimes for parenting advice, about a quarter (23%) of dads do the same. And moms are more than twice as likely as dads to say they at least occasionally turn to online message boards, listservs or social media for advice on parenting (21% vs. 9%). In at least one key area gender does not make a difference: mothers and fathers are equally likely to say that being a parent is extremely important to their overall identity. About six-in-ten moms (58%) and dads (57%) say this, and an additional 35% and 37%, respectively, say being a parent is very important to their overall identity. Parental involvement – how much is too much? The survey findings, which touch on different aspects of parenting and family life, paint a mixed portrait of American parents when it comes to their involvement in their children’s education. About half (53%) of those with school-age children say they are satisfied with their level of engagement, but a substantial share (46%) wish they could be doing more. And while parents generally don’t think children should feel badly about getting poor grades as long as they try hard, about half (52%) say they would be very disappointed if their children were average students. A narrow majority of parents (54%) say parents can never be too involved in their children’s education. But about four-in-ten (43%) say too much parental involvement in a child’s education can be a bad thing, a view that is particularly common among parents with more education and higher incomes. For example, while majorities of parents with a post-graduate (65%) or a bachelor’s (57%) degree say too much involvement could have negative consequences, just 38% of those with some college and 28% with no college experience say the same. Black and Hispanic parents have a much different reaction to this question than do white parents, even after controlling for differences in educational attainment. Fully 75% of black and 67% of Hispanic parents say a parent can never be too involved in a child’s education. About half of white parents (47%) agree. Whether or not they feel too much involvement can be a bad thing, a majority of parents are involved – at least to some extent – in their children’s education. Among parents with school-age children, 85% say they have talked to a teacher about their children’s progress in school over the 12 months leading up to the survey. Roughly two-thirds (64%) say they have attended a PTA meeting or other special school meeting. And 60% have helped out with a special project or class trip at their children’s school. Parents’ level of engagement in these activities is fairly consistent across income groups. Reading aloud is one way parents can get involved in their children’s education even before formal schooling begins. Among parents with children under the age of 6, about half (51%) say they read aloud to their children every day, and those who have graduated from college are far more likely than those who have not to say this is the case. About seven-in-ten (71%) parents with a bachelor’s degree say they read to their young children every day, compared with 47% of those with some college and 33% of those with a high school diploma or less. American children – including preschoolers – participate in a variety of extracurricular activities. At least half of parents with school-age children say their kids have played sports (73%), participated in religious instruction or youth groups (60%), taken lessons in music, dance or art (54%) or done volunteer work (53%) after school or on the weekends in the 12 months preceding the survey. Among those with children younger than 6, four-in-ten say their young children have participated in sports, and about as many say they have been part of an organized play group; one-third say their children have taken music, dance or art lessons. Parents with annual family incomes of $75,000 or higher are far more likely than those with lower incomes to say their children have participated in extracurricular activities. 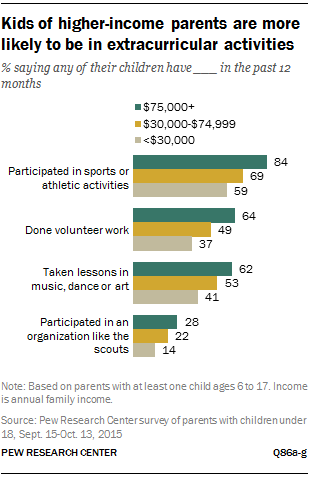 For parents with school-age children, the difference is particularly pronounced when it comes to doing volunteer work (a 27 percentage point difference between those with incomes of $75,000 or higher and those with incomes less than $30,000), participating in sports (25 points), and taking music, dance or art lessons (21 points). Similarly, by double-digit margins, higher-income parents with children younger than 6 are more likely than those with lower incomes to say their young children have participated in sports or taken dance, music or art lessons in the 12 months prior to the survey. Parents with higher incomes are also more likely to say their children’s day-to-day schedules are too hectic with too many things to do. Overall, 15% of parents with children between ages 6 and 17 describe their kids’ schedules this way. Among those with incomes of $75,000 or higher, one-in-five say their children’s schedules are too hectic, compared with 8% of those who earn less than $30,000. But if kids are busy, their parents are even busier. About three-in-ten (31%) parents say they always feel rushed, even to do the things they have to do, and an additional 53% say they sometimes feel rushed. Not surprisingly, parents who feel rushed at least sometimes are more likely than those who almost never feel rushed to see parenting as tiring and stressful and less likely to see it as enjoyable all of the time. Parents employ many methods to discipline their children. The most popular is explaining why a child’s behavior is inappropriate: three-quarters say they do this often. About four-in-ten (43%) say they frequently take away privileges, such as time with friends or use of TV or other electronic devices, and a roughly equal share say they give a “timeout” (41% of parents with children younger than 6) as a form of discipline, while about one-in-five (22%) say they often resort to raising their voice or yelling. Spanking is the least commonly used method of discipline – just 4% of parents say they do it often. But one-in-six parents say they spank their children at least some of the time as a way to discipline them. Black parents (32%) are more likely than white (14%) and Hispanic (19%) parents to say they sometimes spank their children and are far less likely to say they never resort to spanking (31% vs. 55% and 58%, respectively). Spanking is also correlated with educational attainment. About one-in-five (22%) parents with a high school diploma or less say they use spanking as a method of discipline at least some of the time, as do 18% of parents with some college and 15% of parents with a bachelor’s degree. In contrast, just 8% of parents with a post-graduate degree say they often or sometimes spank their children. In addition to the economic gaps that underlie parents’ worries about the safety and well-being of their children, wide racial gaps exist on a few key items. White parents are far more likely than black parents to worry that their kids might struggle with anxiety or depression (58% vs. 35%) or that they might have problems with drugs or alcohol (40% vs. 23%). Black parents, in turn, worry more than white parents do that their children might get shot at some point. About four-in-ten (39%) black parents say this is a concern, compared with about one-in-five (22%) white parents. And this difference persists even when looking at white and black parents who live in urban areas, where there is more concern about shootings. On each of these items and others tested in the survey, Hispanic parents are more likely than white and black parents to express concern. These differences are driven, at least in part, by high levels of concern among foreign-born Hispanics, who tend to have lower household incomes and lower levels of educational attainment than native-born Hispanics. The remainder of this report includes an examination of changing family structures in the U.S. as well as detailed analyses of findings from the new Pew Research Center survey. Chapter 1 looks at the changing circumstances in which children are raised, drawing on demographic data, largely from U.S. government sources. This analysis highlights the extent to which parents’ changing marital and relationship status affects overall family makeup, and it also includes detailed breakdowns by key demographic characteristics such as race, education and household income. Chapters 2 through 5 explore findings from the new survey, with Chapter 2 focusing on parents’ assessments of the job they are doing raising their children and their families’ living circumstances. Chapter 3 looks at parenting values and philosophies. Chapter 4 examines child care arrangements and parents’ involvement in their children’s education. And Chapter 5 looks at extracurricular activities. About six-in-ten (62%) parents with infants or preschool-age children say that it’s hard to find child care in their community that is both affordable and high quality, and this is true across income groups. Most working parents with annual family incomes of $75,000 or higher (66%) say their young children are cared for in day care centers or preschools, while those earning less than $30,000 rely more heavily on care by family members (57%). On average, parents say children should be at least 10 years old before they should be allowed to play in front of their house unsupervised while an adult is inside. Parents say children should be even older before they are allowed to stay home alone for about an hour (12 years old) or to spend time at a public park unsupervised (14 years old). Roughly a third of parents (31%) with children ages 6 to 17 say they have helped coach their child in a sport or athletic activity in the past year. Fathers (37%) are more likely than mothers (27%) to say they have done this. Nine-in-ten parents with children ages 6 to 17 say their kids watch TV, movies or videos on a typical day, and 79% say they play video games. Parents whose children get daily screen time are split about whether their children spend too much time on these activities (47%) or about the right amount of time (50%). Eight-in-ten (81%) parents with children younger than 6 say that their young children watch videos or play games on an electronic device on a daily basis. Roughly a third (32%) of these parents say their kids spend too much time on these activities; 65% say the amount of time is about right. Throughout this report, references to college graduates or parents with a college degree comprise those with a bachelor’s degree or more. “Some college” refers to those with a two-year degree or those who attended college but did not obtain a degree. “High school” refers to those who have attained a high school diploma or its equivalent, such as a General Education Development (GED) certificate. Mentions of “school-age” children refer to those ages 6 to 17. “Teenagers” include children ages 13 to 17. References to white and black parents include only those who are non-Hispanic. Hispanics are of any race. Mentions of Millennials include those who were ages 18 to 34 at the time of the survey. Gen Xers are ages 35 to 50. Baby Boomers are ages 51 to 69.